When it comes to the living dead, I’m strictly vanilla. I want my zombies slow, shambling, mindless and prolific. I have no time for zombies that run, or speak, or suffer from a virus and aren’t really zombies. 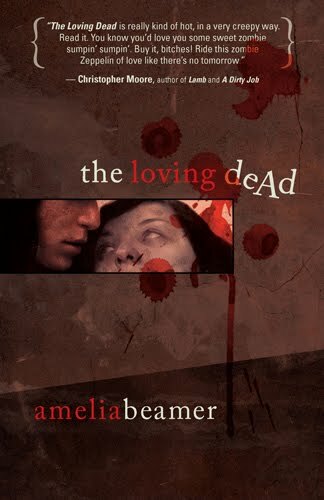 So I began reading Amelia Beamer’s The Loving Dead with a bit of trepidation, since her zombies are not only virus-spawned (and thus not technically dead), the virus is an STD. These zombies are both hungry, and horny. But there’s more at work here. For while the book breaks a lot of my zombie preference rules, it does include one thing I believe is essential for every good horror story: a level of metaphor. The Loving Dead may be about individual characters, but it’s also about a specific class of people: disaffected urban twentysomethings so unused to having anything truly matter that, when the first zombies appear, their initial reaction is to pop in a DVD of Night of the Living Dead. Not to get survival hints, mind you, but just because of the association. Michael and Kate are platonic housemates and co-workers at a San Francisco Trader Joe’s. They throw a costume party the night the zombie apocalypse begins, and initially think it’s all part of the game. When they realize it’s not, but can find no corroborative evidence on TV or the internet, they’re completely at a loss. Separated for most of the story, the twin narratives draw them together at the safest place they can imagine: the island of Alcatraz. The book reminded me most of a fairly obscure Japanese SF film called Matango, or in America, Attack of the Mushroom People. In it, a shipwreck maroons a bunch of 60s-era affluent Japanese on a strange island, where they contribute absolutely nothing to their own survival before they apathetically mutate into the titular mushroom people. In its native country it was seen as a mocking attack on middle-class complacency; recut for the States, it came across as a big helping of WTF? But The Loving Dead shares its sense of a generation so unaccustomed to anything geniune that, when real danger arrives, they can only ignore it, or relate to it through pop culture. By the end, it’s an open question whether the zombies or the humans are the most adrift in their world. The Loving Dead is published by Night Shade Books. It sounds like something I need to read. I have a mild, okay major, obsession with all things zombie. I am somewhat of a purist when it comes to zombie fiction, but different, when done well, is a welcome change. Thanks for the thoughtful review.